Is Royal truly a voice of reason? The past 24+ hours have seen many heads shaking and hitting brick walls or palms of hands as citizens of Birmingham, AL and the surrounding community are left wondering about yesterday’s Birmingham City Council decision involving a vote on zoning for a senior housing development to be built in Pratt City. Council President Roderick Royal implored his fellow councilors to delay a decision for three weeks as he made his case to move the project from its proposed site due to concerns about it being in “a known path” of a tornado. The nearly 1 hour portion of yesterday’s meeting and the resulting vote (8-1 to delay for three weeks) has led to some passionate commentaries in both Weld for Birmingham and the July 11 edition of The Birmingham News. Both Mark and John made so many valid points, so all I can do is take it one step further by pointing at cities like Greensburg, KS and Joplin, MO and ask if those rebuilding efforts are foolish? Maybe we shouldn’t be pushing recovery efforts in New Orleans, or Galveston, TX, or Charleston, SC? Considering I’m a native New Yorker… no, I won’t go there. It’s interesting when you consider just a few months ago there were some folks a few hours north might have considered Royal a voice of reason thanks to a blog post. ChicagoNow’s White Sox Observer, Chris Lamberti, published a post in March about the Council’s decision to support construction of the soon-to-be home of the Birmingham Barons, Regions Field, across the street from Railroad Park. In it, he points to Royal questioning the vote to publicly finance the project as the voice of reason. The author also only points to one city in the state of Alabama for his argument about new ballparks failing in downtown areas. There was no discussion of Montgomery’s Riverwalk Stadium, a renovation of the city’s roundhouse or a look at the Huntsville Stars’ home, Joe W. Davis Stadium. It may have helped (or hurt) the contention about downtown development based on ballparks, but whether a project is successful or not, it takes a lot longer than people think, despite our desire to see things happen yesterday. It may have helped if there was a closer look taken at the underlying philosophy of encouraging development that spurs retail and commercial being the unfair taxation system currently in place in Alabama (thanks in part to its state constitution – the longest in the world). The idea that more retail establishments would provide more revenue makes sense when you know that’s how the state generates its revenue – rather than a system more reliant on property taxes. It does exactly what it’s supposed to do, though it’s tough for a community suffering through The Great Recession to want to spend money on what many would conceive as a luxury item. All of that is to suggest that while the council president might have been informed of additional information in both cases, it wasn’t quite clear to a lot of us exactly how he drew his conclusions. If there’s another factor more reasonable to consider for moving the location of a project that would be federally funded, it would help the public if it were shared instead of operating in the realm of the “we know more information that you do” approach alluded to during yesterday’s debate. The electorate votes officials into office not because they know better, but because we trust they will do the right thing and inform their constituents accordingly. Those are actually two distinct statements. If “The People Are The City” as we suggest via the phrase hanging on the inside of the door of the council chambers, you need to trust the people – on both sides of the equation. Maybe we need to recreate that phrase on the outside of the council chambers so we’re all reminded of that fact as we enter. André Natta is The Terminal’s stationmaster. This website has never endorsed a candidate in a political race during its nearly three-year existence. That said, even if we wanted to, there’s no way that either candidate would warrant an endorsement based on just how childish and asinine they’ve behaved in recent days. The “fresh face” has dipped down to the same level as “the elder statesman” of Birmingham municipal politics and in reality neither one of them have actually talked about the issues – or at least explained what they were actually going to do if elected. When one campaign (or their supporters) is running photos of a candidate’s ex-wife and making accusations about that person’s sexual orientation while the other one (or its supporters) is digging up 10-year old articles that include allegations about his personal life instead of talking about the issues – the real issues – it becomes more about character assassination instead of talking about moving Alabama’s largest city (for now) forward. We heard less about Mr. Bell’s current plans for his hometown and how electing him would be different now than previously and more about him being tied to Birmingham’s present – one that is described as a city “dying on the vine.” We heard him talk about himself in the third person (something that is incredibly annoying) and more insulting one liners than anything else, not to mention supporters talking about Birmingham becoming a colony – perhaps the only way to sustain our current population numbers right now short of fixing our educational system – even though charter schools are apparently not the answer in his eyes if it means that the city will have to pay the bill. I’d have more links for this section but the Black and White article kind of covers the good, the bad and the ugly – whether true or not. We heard more about Mr. Cooper’s connections to Andrew Young and saw a lot of arm waving and heard less about his father’s past connections to several influential companies that conduct business in metro Birmingham that may be his key to bringing about change in the community. We heard less about the fact that the former U.S. Ambassador to Jamaica once served as the senior vice president for Volkert and Associates, an engineering firm that does a great deal of work here in the city. He is also a former member of the board of United States Steel – (see page 6) – owner of more than 200 square miles of land located within city limits, a lot of it undeveloped. What disappointed me the most ties into the post I wrote back when this roller coaster ride began. I still don’t think that Birmingham needs a savior (even though they need someone to save it from this sham of an election cycle). Neither man did the one thing that would have made a decision on who to vote for a slam dunk – neither one of them called off the attacks once it became apparent that many people in the city were tired of them. I hope that whoever wins this evening decides to actually be that leader or head coach that we need and not worry too much about getting re-elected. Then the city would truly benefit. The only thing scarier is the issue of whose minds the mud slinging actually changed. I encourage those of you registered in Birmingham, AL to vote today – even if you feel as though it will not mean anything. This city has been able to move forward – albeit slowly – in the past and can continue to do so regardless of who ends up in the big office on the third floor of Birmingham City Hall. But I may encourage all of you to look deep within yourselves to figure out what you can do to make Jones Valley a better place for all people – and start thinking about who can truly help us lay out a path for the future come 2011. Tea Party a hit in Hoover? Hot barbecue sandwiches, potato chips, Southern sweet tea, vintage American Flags, lawn chairs, kids playing with their dogs in the open field, music, and green grass. Sounds like just another picnic day in Alabama. Add some clever protest signs and some great radio personalities speaking and you’ve got the start of a revolution! Last week I attended Birmingham’s conservative Tea Party protest. It took place at Veterans Park next door to Spain Park High School in Hoover. Being a Libertarian leaning Conservative myself, I had been looking forward to this for a few weeks ever since I found out about the Tax Day tea parties on a few conservative web sites like TCOT (Top Conservatives on Twitter) and some of the radio talk shows like Glenn Beck and Sean Hannity. I got there right as the sun was starting to set over the rolling hills of the Spain Park area and already there were at least 300 people chilling out, setting out blankets on the lawn, and setting up booths with food, patriotic t-shirts, literature and information about the Fair Tax, the Constitution, and fact sheets about the current administration’s backward policies. 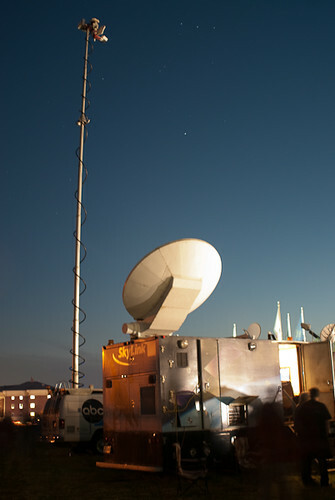 Up-link vans from ABC 33/40, WZZK, and WAPI were set up and a satellite up-link truck for Fox News had set up, ready to simulcast on the Sean Hannity show on Fox News later on that night. Dogs were chasing Frisbees and people were crowding in to get a front row spot. The action started about 30 minutes later with Matt Murphy of 101.1 FM The Source and a few other local personalities. They spoke their minds about some of the hot topics like the government bailout and taxation. There was some great music in between and we saw a lot of creative signs. At about 7:30 p.m., nationally syndicated talk show personalities Rick and Bubba arrived on stage and entertained and informed for a few minutes while we were waiting for the Sean Hannity show to do the simulcast. During this time more and m0re people had continued arriving. According to law enforcement reports, Hwy 119 was backed up all the way to Hwy 280 with people trying to get in and park and it didn’t stop until about 8 p.m. When the big on-air moment came, everyone “went nuts” as Rick and Bubba would say, flags waving and people chanting “USA, USA!”. Overall the unofficial headcount from the event coordinators was somewhere in the 3,000 range with more than 4,000 coming and going making our tea party one of the largest out of the over 800 parties held in the nation last night. What I came away with from that night was, that THIS was the first step that a citizen can take to let your voice be heard. 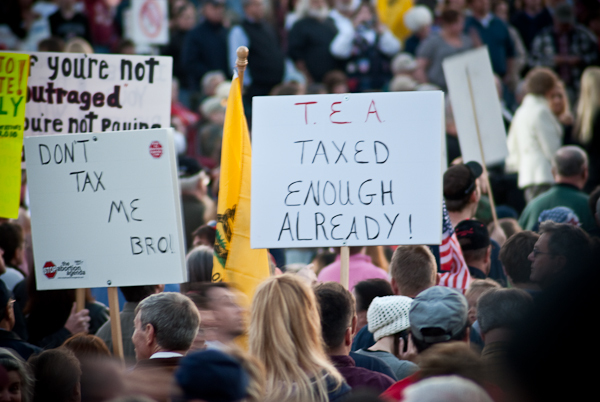 The tea parties are a completely non-partisan rally. It wasn’t about Obama hatred (although I’m sure the sentiment was there), it was about the common man having a voice and letting Washington hear that voice. I was also impressed that the conservatives were finally embracing social media using platforms like Twitter and Facebook to organize the event. The Birmingham party was almost completely organized grass roots with a Facebook page and word of mouth and throughout the country real time details were posted on Twitter. The common person these days has no idea what they can do, if anything. I think that the tea parties has shown people that they CAN make a difference. Start little, do something big! Let’s keep our government accountable for their actions. Josh Self is a contributor to The Terminal. He also maintains two blogs – a personal one, The Horse, and The Wedding Photogblog. I blame those years attending the Savannah College of Art and Design. Others may consider the years I spent growing up in The Bronx and being a short bus ride away from the zoo and our botanical gardens. No matter what the real reason is, I know that even when I’m struggling to make ends meet, I see access to the arts as an important piece of the puzzle. The cultural opportunities that exist in metro Birmingham are numerous and sometimes we take them for granted. This is despite being one of the most generous cities in the country when it comes to supporting non profits. The case for support for many may be one that becomes harder this year as the people deal with the effects of the economic crisis. Enter the current situation involving the occupational tax in Jefferson County. Many people who don’t live in the county see the tax as something that is not necessarily fair to them. They want to see tangible results of paying the extra money. Something I’ve realized in the years I’ve lived here is that no one does a really good job of explaining how monies are used (including us). A current grassroots campaign may provide some transparency and accountability for at least a portion of the funds as well as a warm and fuzzy feeling for those that pay the tax who live outside of the county. The Cultural Alliance of Greater Birmingham is suggesting that a rewritten occupational tax that could stand up to legal challenges should have a portion of it set aside for allocation to culural organizations throughout Jefferson County. I think it becomes a lot harder for those not currently paying the tax to say that there is no value to doing so if the Alliance is successful in their efforts. The money collected would have the potential to improve the quality of life for everyone in the region, providing institutions like the McWane Science Center and the Birmingham Civil Rights Institute the chance to do more for those that live nearby and those that are visiting our city. Increased funding for these institutions have the potential to have a greater economic impact long term than the monies that we’re about to lose as a result of the Super 6 relocating to the new football capitols of the South. That last sentence may be one that riles more than a few feathers here in Birmingham, maybe because we don’t necessarily pay attention to these other jewels in the region. As a baseball fan, I can think of a lot of people that will be venturing into The Magic City next year to catch a glimpse of America’s oldest ballpark as it turns 100. Hearing the Symphony perform Rhapsody in Blue doesn’t hurt either. Then there are those children benefitting from programs like Scrollworks… Maybe times have finally changed, and we need to be ready to embrace them. Currently, it looks like this proposal is facing an uphill battle. State Representative Linda Coleman has introduced legislation that would re-instate the tax as is. I’m not really sure if that’s the best case scenario considering that the current tax has been under some legal scrutiny recently. This new version provides some transparency to a funding source that appears to be greatly needed, especially as our county contemplates bankruptcy as an option to deal with our sewer crisis. As Birmingham prepares to potentially take its place in the New South, this proposal would provide a tool that enables it to reach its goal sooner rather than later. With much attention focused on issues that mean nothing in this upcoming, lengthy campaign to select our state’s next Governor, luckily one issue that should be front and center in the coming weeks will receive some attention today because of presumptive Democratic candidate Artur Davis‘ appearance at a summit in downtown Birmingham as its keynote speaker. As the State Legislature begins its new session on Tuesday with a potential first step plainly in front of them, the question is whether or not transit can become the issue that symbolically and physically begins to unite this state and take it into the 21st century. One point that has been raised again and again about the Inauguration was the ability for Washington’s Metro system to move more people than normal (4 ½ times more to be exact) and to demonstrate just what it would be like with limited access for cars. It’s also definitely been a question on some minds as my last post didn’t get any feedback except for one person wanting the discussion to look to transit. A proposal being presented by Alabama State Representative Rod Scott (D) allows the state’s numerous transit systems (and there are several) to work together to collect funds to move all of them, large and small, forward. A task force would study whether or not a fully functioning commission would be necessary and identify how this commission would be able to work in the best interest of the entire state to include transit solutions in discussions about transportation in the years and decades ahead. For those wondering if even some of these transit providers could get along, I recently attended one of their first meetings and while there may still be a couple of questions, all agree that the issue of transit and securing adequate funding to provide the service that the people of Alabama need is a top priority. There are monies that may be available if the President’s economic stimulus plan is passed that would provide a way for the state to take a good, hard look at transit and how it could also become a major tool in economic development, allowing not just those living in rural communities or our state’s inner cities but those living in our wealthiest neighborhoods to be able to have a relatively inexpensive, reliable and efficient method of travel to and from work. Even if those monies end up not being available, the collective bargaining power of this alliance among transit providers should allow for other funding sources to be identified. The benefits in Birmingham are ones worth pointing out. A light rail system similar to our long departed streetcar system would provide an easy way for folks to get around town, perhaps going to work, a concert in Railroad Reservation Park, or maybe even give folks a much cheaper way to get to Birmingham-Shuttlesworth International Airport. Of course, being able to fully fund our bus system and seeing folks use it consistently will determine that future than anything else, particularly in light of Birmingham’s street paving project effectively halting any plans for it (unless the Regional Planning Commission has finally worn the mayor down on the concept of bus rapid transit, which could do many of the things a light rail system could do), though the paving needed to be done. We could even get to the point where those in our tech community could enjoy WiFi during their commute, a service that the Bay Area’s BART system recently announced would be expanded to be systemwide within the next two years. After speaking with some of the principals and attending the first meeting of the group supporting Scott’s measure in Montgomery (comprised in part of some of Alabama’s larger transit authorities) I believe that it’s something whose time has come. It is not a question of turning our backs on our cars as much as it is an chance to help jumpstart the future of the state and of gaining true support for it. Yesterday’s debacle at the BJCC board meeting shines a bright light on some of the issues still facing our region despite having attempted to put on a face to the outside world that we’ve overcome. Even more disturbing were the comments that have been appearing after hearing about the exchange between Birmingham Mayor Larry Langford and State Representative Mary Moore. The underlying tone of the discussion seems to insinuate that all African-American contractors do bad work (not to mention the fact that other minority contractors don’t seem to exist) and that the facility shouldn’t even be built because we can’t support a professional sports team. I’d ask those throwing that second stone all the time to take note that in most cases, the problem has not been lack of community support for the team but the lack of success of the league. In many cases, the city led league attendance figures. Plus, if we do so poorly supporting sports teams, why do we even get considered for things like U.S. Soccer and the upcoming Davis Cup matches. More importantly, the facility should not be seen as only being used for those 8-10 sporting events a year. Our convention center needs the space, period. Whether we want to admit that or not, it’s true. Despite the fact that the new facility will never fully recoup its construction or operating costs for itself, it is something that can provide long term jobs and revenue for this region. We spend so much time in this city taking pot shots at each other and not realizing that the true change is going on despite what loud mouths with bully pulpits say (and I’m not talking about Larry). As we continue to grow and change regionally, we must start to act our age and put the petty bickering behind us. The fact that a state constitutional amendment can be introduced at the whim of someone feeling that there is not enough being done is absurd and speaks to the issue of self-rule and why the 1901 Constitution should be replaced as soon as possible. This is an example of wasting taxpayer dollars on an issue that should be settled locally without having to run to Montgomery to have Daddy or Mommy fix it for us. The mayor is correct – he represents the city on the board. Having council members appointed may take us down a very slippery slope, especially considering some of the positioning that people are starting to do now for 2011. It should not be political and should serve the best interests of Birmingham and the community. While in Washington for the Inauguration, I was surrounded by people of all races and creeds. I was part of a mass of humanity that did not have one incident or arrest (save for that one person falling from a tree trying to see The Mall). The issue of race, at least in that corner of the world, was there but ceded to the idea that we had to work together to solve problems without finger pointing and the We do need to do something that will allow for more minority contractors and minority businesses in general getting that foot in the door so that they can achieve the American Dream. It is our duty to help change things to make them better. However to ignore those groups that are truly minorities when looking at the numbers in Birmingham and the surrounding area while doing it makes it shallow and pointless.